Join the discussion on our forums! 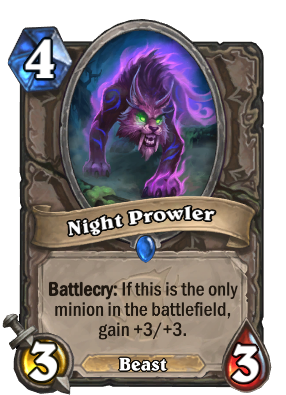 Come discuss Night Prowler over in our dedicated Night Prowler discussion topic. The sleeper of the set, When looking at this card the first time I notices that the scenario where the board is empty or can be emptied by trading your board is quite common. This card will be very strong against cubelock or any control deck, and will be a tie breaker in tempo matchups where you have the advantage or you are even. Rewards early removal and midrange decks, but easily taken care of by turn 4 or 5 by removal spells. Still dangerous but maybe not entirely useful. Missed opportunity for 4 mana 7/7. a great card. though idk how it'll do seems like the meta might shape out to be some kinda midrange thing, but that's a guess from what the cards for some classes are looking. A bit smaller, but much easier to activate than Core Rager. Perfect on curve follow up to Lone Champion! Fitting this can be played after 'The End is Coming!' is uttered. Druid ramping up and throwing this can really suprise slower decks. Although it might be just a top deck mode minion.